KATY, Texas — The ACU Wildcats have spent the better part of the last three decades searching for their One Shining Moment. 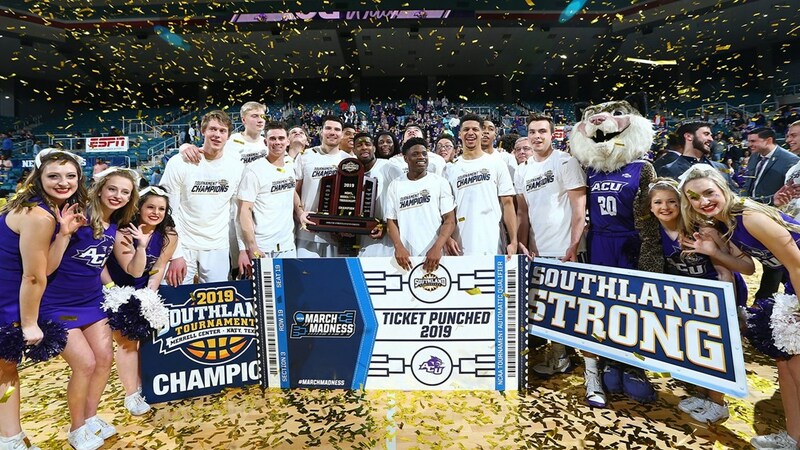 They found it Saturday night at the Merrell Center as the Wildcats beat New Orleans, 77-60, to win the Southland Conference men’s basketball championship and advance to the NCAA Tournament. ACU will find out Sunday afternoon its seed, opponent and region, but what became crystal clear Saturday night was this: head coach Joe Golding and his staff and players have written one of the great stories that thrive in March Madness. Just six years ago, the Wildcats — without a history of sustained success in men’s basketball over the previous 30 years — began the transition from NCAA Division II membership to NCAA Division I affiliation. The first season included blowout losses at Duquesne, Maryland and Iowa and the losses mounted over the next two seasons as ACU learned the hard lessons of life at the Division I level. But Golding was given time to build a program and recruit the kind of players he knew would win at ACU: tough, selfless kids who would buy into the school, the coaches and the program he was trying to put together. It all started coming together four years ago when a quartet of freshmen — Jaylen Franklin, Jaren Lewis, Hayden Farquhar and Hayden Howell— arrived on campus and began to turn the program’s fortunes, along with established foundation players like Parker Wentz, Austin Cooke, Duran Porter, Isaiah Tripp, Drake Green and Alexander Milosavljevic. They later added players like Jalen Little and Tevin Foster to the mix to help the transition. ACU missed out on the conference tournament last year after a late-season slump, but still registered the program’s first winning regular season (16-15) since 2007-08. The Wildcats also qualified for a postseason berth as they played — and lost in overtime — at Drake in the first round of the collegeinsider.com (CIT) Tournament. That made the goal for 2018-19 simple: put the lessons of the past to use and set about the business of winning games, getting to the conference tournament and playing for a championship. ACU started the season 7-0 and never looked back, running out to an 11-2 non-conference record that led to a 14-4 conference record and runner-up finish. The Wildcats set a program record for wins in the regular season (15) and wins in a conference season, and the 27-6 record heading into the tournament is tied for the most wins in a season in program history. Not even the loss of starters Jalone Friday and B.J. Maxwell to dismissal from the team in late February could slow the train. ACU responded to their departure by winning four of their last five regular-season games to clinch the double-bye in the tournament. Then came Friday night’s 69-66 semifinal victory over a Southeastern Louisiana team that had punked the Wildcats at Moody on Feb. 23, 48 hours after the two starters were dismissed from the team. All of that led to Saturday night, arguably the greatest team moment in the near-100 years of ACU Athletics. I was asked earlier Saturday afternoon by Lowell Galindo — the play-by-play voice for the game on ESPN2 — to tell him about this team, and I told him it wasn’t about this year, but that it was about the last six years. Joe likes to use the phrase “Trust the Process.” In fact, those of us who are around this team on a daily basis should have T-shirts made with the phrase emblazoned across the front. But there are two words in that phrase that have been crucial to building this program: Trust and Process. Those two then set out changing everything about the program and the mindset of what it takes to win. But those changes didn’t come without doubt, adversity, sleepless nights and long recruiting trips to small gyms across the country. There were blowout losses at Boise State and Loyola-Chicago and Towson and UC-Riverside and San Francisco. But still they trusted. There were recruiting battle wins and losses. But still they trusted. There were player dismissals and defections. But still they trusted. There was the real threat they would be fired. But still they trusted. Those four seniors had nothing to base any expectations on when they chose Abilene and ACU before the 2015-16 season. They chose it because they trusted Golding and Tanner to build the program they had promised them. It didn’t take long for fans to see that those four were special. That they held the promise of changing a program’s fortunes. Of providing hope that the Wildcats would go from a program that had no brand or name recognition in the world of college basketball to one that could compete and win at the Division I level. They won 13 games in each of their first two seasons while Golding and Tanner and the rest of the staff — Ted Crass, Antonio Bostic and, this year, Cam Griffin and Jon Trilli — continued to scour the county for players. Payten Ricks and Trey Lenox and then Kolton Kohl and Tobias Cameron were all added to the mix to give the coaching staff what they believed was a team that could compete and win at the Division I level. It began to turn last season as trust met process. The Wildcats finished with 16 wins (the most in a season since 2007-08), had a winning regular season and, despite that late-season slump still got to the postseason for the first time as a Division I program. And it was on the backs of Foster, Franklin, Lewis, Farquhar and others that it happened. Franklin is, perhaps, the most dynamic player in the history of ACU basketball. And Lewis is one of the quietest, most humble and most ferocious competitors to wear the purple and white. Franklin and Lewis and others who have come after them changed the way the Wildcats played. They played above the rim, something that hadn’t been the case at ACU for a couple of decades. Franklin had at least three dunks in his first game at ACU and longtime observers stared at each other and thought “this is what a Division I basketball team is supposed to look like.” His tomahawk dunk over New Orleans big man Scott Plaisance in Saturday night’s championship game was the latest example of his stamp on the program. Lewis was never better in his career than he was Saturday night, finishing with 20 points, six rebounds and three steals and then carrying home tournament MVP honors. He was unstoppable inside, hitting 10 of 17 shots, most of them inside the circle that Golding told his team they had to win in order to walk away with the trophy. Once again, they trusted him and that trust delivered a championship. And Farquhar – after struggling to an 0 for 9 shooting game in the semifinals — was huge in the final, finishing with 14 points and eight tough rebounds, and saving his best for last. His back-to-back 3-pointers 30 seconds apart inside the final three minutes put the dagger in UNO and punched ACU’s ticket to the Big Dance. All the practices, film sessions, weight room work, summer days spent working out in Moody while friends were on vacation were all made worth it. All the study hall hours, bus rides, holiday weeks spent on the road instead of with family counted for something when those two 3s splashed home. The Process was complete. Because they all Trusted. So proud of ACU Athletics!